What is the gravedigger's thesis? Simply put it is, The Christian faith contributed decisively to the rise of the modern world, but has been undermined decisively by the modern world it helped to create. The Christian faith has become its own gravedigger. In the 25 years since philosopher and social critic Os Guinness first published "The ""Gravedigger Files," much has happened: the fall of the Soviet Union, the rise of the computer age, the re emergence of China and India, the rise of Islamic terrorism, and the worldwide revitalization and politicization of religion. The central mystery of Dr. Guinness's spy novel inspired by his affection for John le Carre thrillers remains unsolved: Can Christians regain the full integrity of faith in Christ while fully and properly engaged in the advanced modern world? 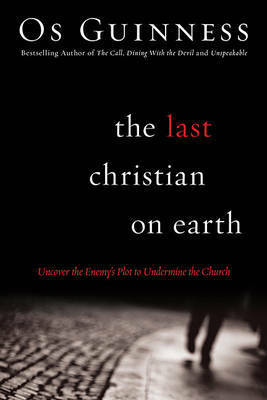 This new edition of "The Last ""Christian on Earth," which includes previously unpublished top-secret memos, is Dr. Guinness's parable about the future of the Christian church in the West. Written in the grand tradition of le Carre, Fleming and Clancy, this thriller pays homage to the genre while transcending it because the real-life ending has yet to be written! OS GUINNESS is a philosopher, social critic and prolific author who was born in China and educated in England, and who has worked in the Washington, DC, area for more than 25 years. He has been a freelance reporter for the BBC, a visiting fellow at the Brookings Institution and a guest scholar at the Woodrow Wilson Center for International Studies. In 1991, Dr. Guinness founded the Trinity Forum, which hosts discussions with senior leaders in business and politics. He speaks widely at universities and business and political conferences around the world. He lives in McLean, Virginia, with his wife, Jenny.